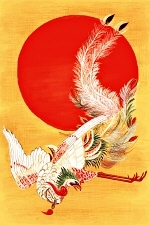 Phoenix is a legendary creature that is called "Houou" in Japanese. Legend has it that all kinds of birds are born of phoenixes, therefore, phoenix is thought to be the king of birds. Phoenix symbolizes benevolence, charity and brilliance.